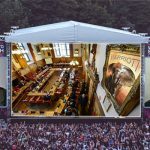 North Yorks Enquirer | EXCLUSIVE: The BULLYGAN Scandal: A Skillful Response? 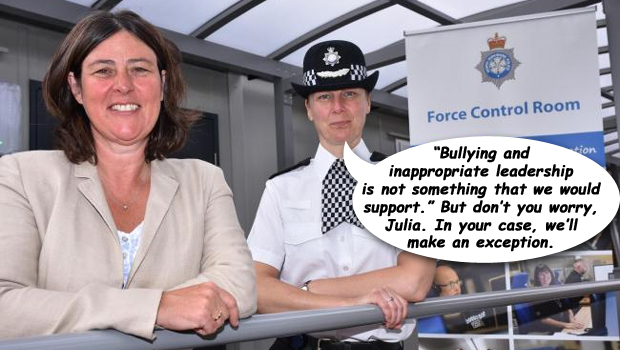 In October, North Yorkshire Police & Crime Commissioner Mrs Julia Mulligan was found guilty of bullying former employees of her Office of the Police and Crime Commissioner for North Yorkshire (OPCC). NYE report here. 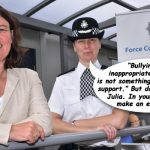 But NYE readers will have been shocked to read in the BBC article here, that two more employees have made bullying allegations against North Yorkshire’s Police & Crime Commissioner Julia Mulligan. Mrs Mulligan has committed this type of misconduct against employees of the OPCC while she was serving as a senior public official charged with oversight of the police. 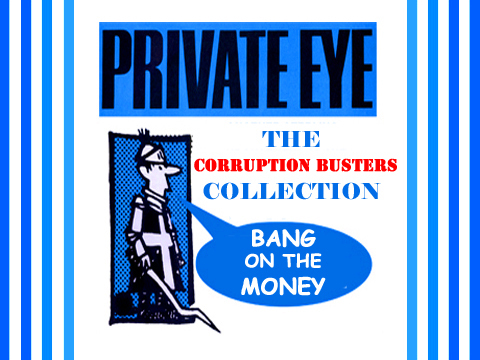 This will have had a seriously damaging impact on the efficient operation of the OPCC. Following the news that more victims have come forward, incredibly Mrs Mulligan stopped denying the allegations, did a U-turn and issued an apology, saying she was “very concerned and truly sorry that anything I may have said or done could be perceived in the way described by the complainant“. 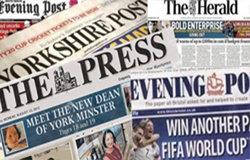 Following correspondence with the North Yorkshire Police & Crime Panel, the body responsible for monitoring the Police & Crime Commissioner for North Yorkshire, Julia Mulligan, there have been further developments in this ongoing bullying misconduct scandal, brought to our readers exclusively by the NYE. The original investigation: Fatally flawed. The original investigation conducted by the North Yorkshire Police & Crime Panel found that Mrs Mulligan was guilty of bullying a member of the Office of Police & Crime Commissioner’s staff, but was not guilty of harassment. 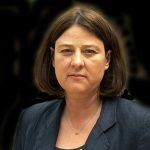 Following correspondence with the author, the NYPCP admitted that it had only considered the allegations of harassment in the context of the Equality Act 2010, not the Protection from Harassment Act 1997. The Equality Act was not the appropriate statute to use to determine if an offence of harassment had occurred, because under these circumstances it would be impossible for an offence of harassment to have been committed under this act. The panel should have considered the allegations of harassment against the standard applied in the Protection from Harassment Act 1997. Which is the law normally applied to determine if an offence of harassment has been committed. Harassment is defined under the act as a course of conduct which caused alarm or distress, which is clearly the case. The finding in the original investigation that Mrs Mulligan has not committed an offence of harassment is misleading. It should state that the Mrs Mulligan has not committed an offence of harassment within the meaning of the Equality Act 2010. It should then go on to say that the normal standard set by the Protection from Harassment Act 197 was not applied. The investigation is fatally flawed. I asked both the Police & Crime Commissioner and the NYPCP if North Yorkshire Police had been requested to conduct a harassment or misconduct in public office investigation. Police & Crime Commissioner Mulligan replied that any criminal investigation was a matter for North Yorkshire Police. The NYPCP responded that this was a matter for the Independent Office of Police Conduct. Predictably, North Yorkshire Police has not commented. 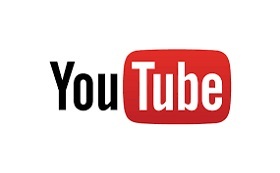 The complainants may not have specifically alleged criminal behaviour, but of course that does not exonerate the NYPCP from considering if harassment within the meaning of the Protection from Harassment Act had occurred. This appears to have been conveniently overlooked. Mrs Mulligan was the Conservative Party candidate for the office of Police & Crime Commissioner. As such, she is bound by the Conservative Party Code of Conduct for Conservative Party elected officials, which prohibits bullying. The code can be accessed here. It is very clear in its prohibition of bullying. I understand that, having been found guilty of misconduct, Mrs Mulligan did not voluntarily refer herself to Conservative Party Headquarters, although that was her duty. Mrs Mulligan has confirmed to me that she will not resign. 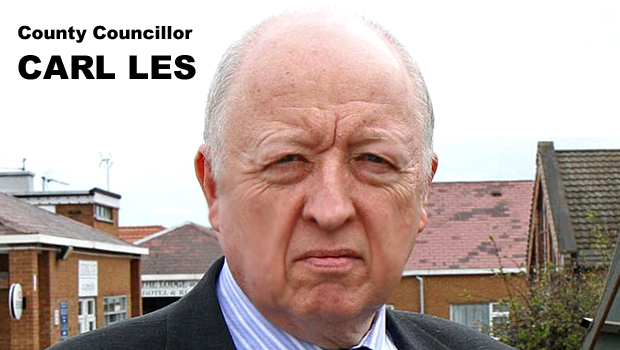 It now transpires that following correspondence from the author, the Chairman of the NYPCP Councillor Carl Les, acting in his capacity as a senior Conservative Councillor, has referred Mrs Mulligan to Conservative Party Headquarters, in accordance with the Conservative Party Code of Conduct. The implication being that Mrs Mulligan is to undergo investigation by Conservative Party Headquarters for contravening the Conservative Party Code of Conduct on bullying and not keeping the party fully informed of the findings against her. 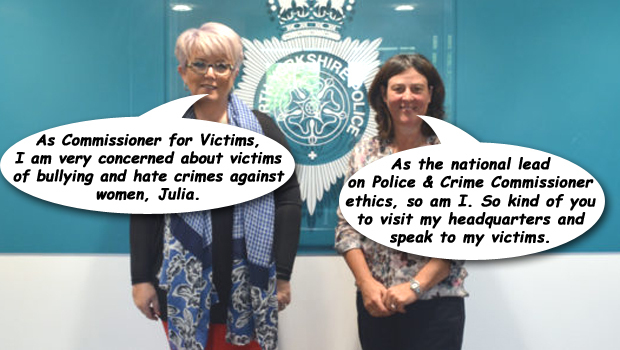 Invited the Commissioner for Victims, Baronness Newlove, to her Headquarters and get photographed with her, thereby associating herself with a compassionate appearance that is not reflected in the way she treats her staff. Criticised the North Yorkshire Police and Crime Panel Sub Committee that investigated her despicable behaviour, -thereby undermining it- because it had the audacity to conduct an impartial investigation and to uphold the allegations. 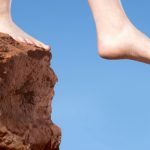 Ordered that the judgment was not displayed on her website, preferring instead to only release her own version of events in a personal statement. Did not refer herself to Conservative Party Headquarters over the allegations, although she had a duty to do so. Issued a self-serving apology when the evidence became overwhelming, no doubt in the hope everything will blow over. In summary, Commissioner Mulligan’s response has been typical for a PR wonk that is also a politician. 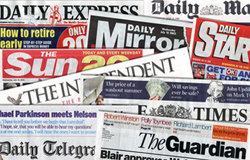 First: admit nothing; second: deny everything; third: denigrate your victims; fourth: pour scorn on the body and the process that properly upheld the multiple complaints against you; fifth: continue to deny; six: indulge in media manipulation by only releasing your own version of events on the website, making no attempt to give a balanced overview, then seven: conduct an internal cover-up by concealing the evidence from Conservative Party Headquarters, to evade any more embarrassing questions. 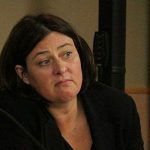 Then, when further complaints come to light, no doubt realising that with six members of staff/former members of staff out of fourteen employees (43%) in the OPCC complaining about her bullying, Mrs Mulligan worked out that she is caught bang-to-rights and further denial is not going to work. So,eight: she seamlessly changed tactics, did a U-turn and issued a mealy-mouthed apology about the “perception” of her behaviour, which does not admit any liability – presumably in the hope that this will all go away. Commissioner Mulligan has been censured for a very serious act of misconduct. Her behaviour appears ingrained, repetitive and characterised by a failure to recognise any fault in herself. It appears to me from this she will find it impossible to reform. 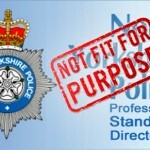 This has an impact on the credibility and reputation of North Yorkshire Police and its operational effectiveness. Returning to the above police statement on bullying and harassment, how can a Constable credibly arrest a man-in-the-street for harassment or bullying, when the Police & Crime Commissioner routinely indulges in similar behaviour, which the police do not investigate and goes unpunished? 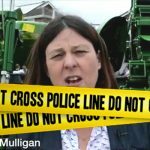 a subject of ridicule because of the actions of Police & Crime Commissioner Julia Mulligan (Conservative). In my opinion, this, together with the effect her antics will have had on the efficient operation of her office, means that, in the best interests of the force, Mrs Mulligan should go. 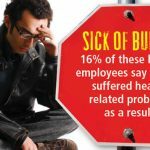 Under normal circumstances, when a senior manager had been found guilty of multiple counts of bullying against his or her staff, they would be summarily dismissed for gross misconduct. This is particularly true, given that six employees or former employees have now alleged that Mrs Mulligan indulges in bullying behavior. It appears to me that Mrs Mulligan has also undermined the effective operating of her office. She may also have opened up the OPCC to legal action and a claim for damages. 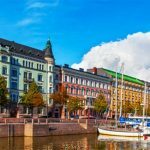 Yet – incredibly – only minor administrative action has been taken against her. 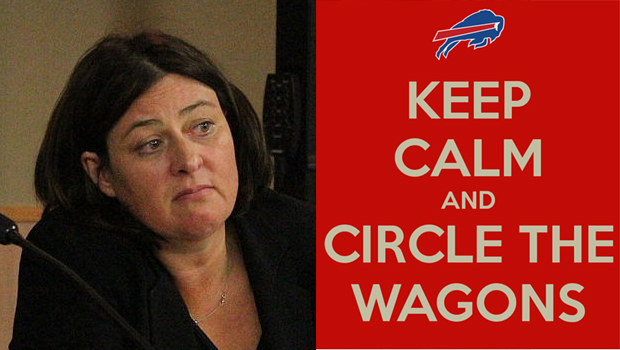 Pardon me a cynical aside, but do I detect the sound of the wagons forming into a circle around Julia? 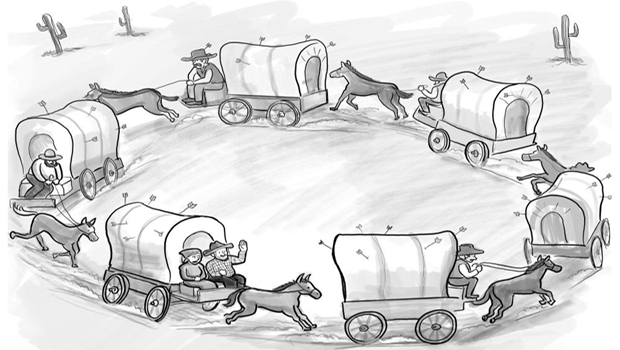 [Definition: Refers to the American Indian Wars when, at the end of the day, the pioneers wagons would be put into a circle, to form a defensive position to repel Indian attack. Now used in slang to mean preparing for an all-out defensive action]. In my opinion, North Yorkshire Police does not need to be further embarrassed by a lame duck Police & Crime Commissioner. If she won’t resign then she should be sacked. The NYE will continue to cover this story.